As you walk to the tee on this par 4, 184 metre hole, you’ll see that you’ve climbed back up again, because you can see the Strathgartney TV tower way in the distance. That’s one of the highest points on PEI, so you’re pretty high up! 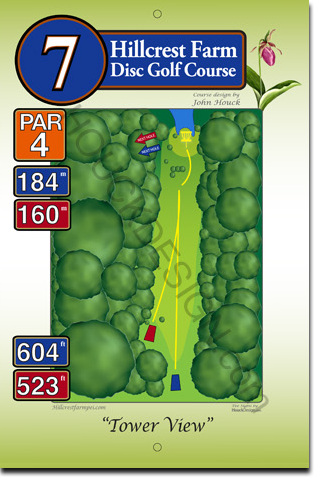 This fairway curves downhill to the right, through a grove of maple trees to gently lead you to the basket at the bottom.